ew Zealand’s wine profile, with an image first centred on intense, vibrant, fruit-driven whites for immediate consumption is now in a state of perpetual evolution. It’s true many winemakers have fashioned wines based on a dogma of technological expertise but the influence of the European quality revival, that is, one underpinned by better health in the vineyard, is also apparent. Slowly too, the best sites are being unearthed even if more time is still needed to emulate many of the premium old world areas where they’ve had centuries to define and redefine the grape and site match. The direction for New Zealand provided by well-educated, widely travelled, outward-looking winemakers is now being given increased focus as new talent, be it home-grown or imported, is attracted to what is seen as an increasingly glamourous vocation in a beautiful setting. The result is not only wines of better structure and increased longevity but also of greater individuality and flair. Despite rapid expansion over the last two decades, New Zealand’s output (white dominated) is still small in the global context. With a generally cool climate the question of which grape varieties to plant and where became more important than in warmer, easier climes. Thirty years ago Müller- Thurgau dominated the vineyard area; 10 years later Sauvignon Blanc took on a significance way beyond the area planted to it; and in the last couple of decades Chardonnay has been the vine planted in greatest numbers, with Pinot Noir coming up on the rails. Along the way Cabernet Sauvignon has found its place (in Hawkes Bay and on Waiheke Island) and Merlot has been more than a mere flirtation. Gradually the industry has moved southwards through Gisborne and Hawkes Bay before confirming Marlborough as its leading region. There is increasing regional or even site-specific identification for many quality wines with less cross-regional blending than previously. New Zealand’s first vineyard was planted in the far north of New Zealand in the the Bay of Islands but its early history was centred around Auckland, the country’s largest city. Despite the city’s often warm, humid conditions, some favourable mesoclimates are to be found in Kumeu and Huapai (to the west), where producers have been successful with Chardonnay as well as Merlot and Cabernet Sauvignon. 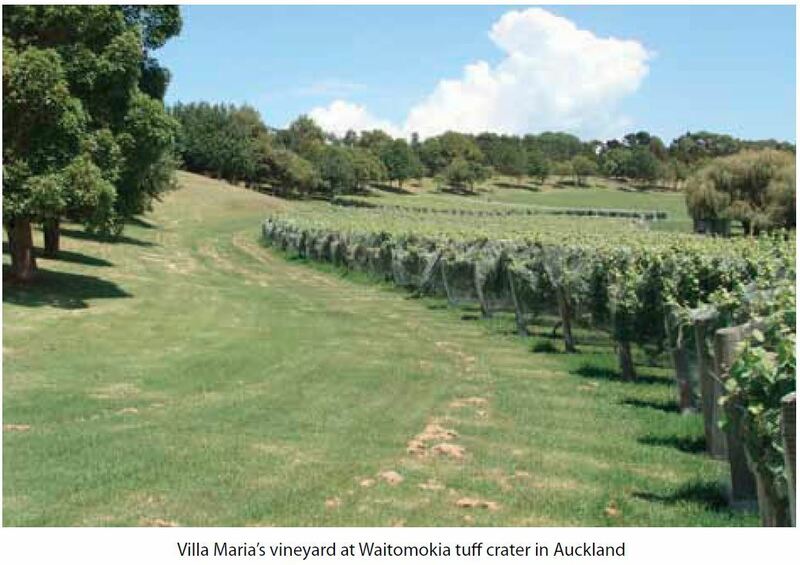 Other vineyard pockets on the fringes of a sea of suburbia include Matakana, Cleveden and Mangere but it is offshore in the Hauraki Gulf on Waiheke Island, where conditions are generally warmer and drier, that Merlot and Cabernet have been most successful, a fact highlighted and confirmed in many vintages since Stonyridge’s first in 1987. There are now more than 30 wineries on the island. 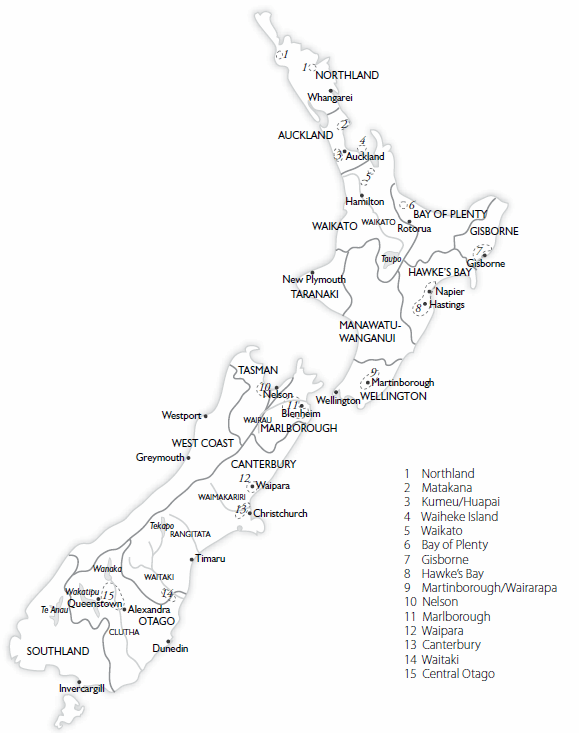 In the eastern central part of the North Island are its two most productive regions. Gisborne often struggles with rain and humidity during the growing season yet with the right dedication can also show that good quality fruit is not the sole preserve of the more illustrious Hawkes Bay. Here it is drier in what has become the country’s leading area for blends based on the classic Bordeaux varieties. Malbec, Merlot and Cabernet Franc as well as Cabernet Sauvignon make an important contribution to the region’s reds. The number of fine, fully ripe examples and the number of premium reds continues to increase. The best have an intense berryish fruit, balanced oak, good acidity and ripe tannins. The Gimblett Gravels, free draining gravels centred on an old river bed, are being promoted by a consortium of producers as a geographically-defined ‘appellation’. Many leading producers now also make some stylish but ripe Syrah, while Zinfandel is also gaining a foothold. Whites are led by Chardonnay but there’s also good Gewürztraminer. A long way south of Hawkes Bay is the Wairarapa region, lying within the political region anchored by the country’s capital, Wellington. The most prized viticultural land, the terraces around the small town of Martinborough, is extremely limited, but other favoured pockets of viticulture could yet emerge from a region that benefits, like other protected eastern regions, from a relatively low autumnal rainfall. The best early examples of New Zealand Pinot Noir came from here though they remain relatively few in number. Some potential has also been realised for Chardonnay, Riesling and, lately, Pinot Gris. Marlborough at the north-eastern tip of the South Island is New Zealand’s most important viticultural area. Like Hawkes Bay it is favoured both climatically, often with fine weather late into the growing season, and geologically, thanks to mostly free-draining soils. Yet most of the major decisions about where and what to plant were made on a purely commercial basis. That is, where the land was cheapest and the grape most prolific. Montana’s (now Brancott Estate) development of Marlborough in the 1970s was intended as a cheap source of Müller-Thurgau but some Sauvignon was planted as well and it has never looked back. The vineyard area continues to swallow up increasing amounts of its two main valleys, the Wairau and the Awatere, and even some hillside slopes. The most important grapes are Sauvignon Blanc, source of many of the country’s top examples, Chardonnay and Pinot Noir. The range and intensity of flavour can be most impressive where yields are restricted, while the best producers also draw out increased depth and structure. Of growing importance is Pinot Gris, while Riesling, both in dry and sweeter styles, has been successful. Nelson, slightly cooler and wetter than Marlborough, perseveres with a similar grape mix but site selection is more critical as is the dedication required from top producers such as Neudorf. The vineyards of Canterbury lie to the west of Christchurch, the South Island’s largest city, and are well-protected from the worst weather from the west by the Southern Alps. The most promising sub-region, Waipara, though usually afforded long fine autumns, requires further protection from north-westerly winds in the form of windbreaks. Although the soils are calcareous and well drained, there seems only just sufficient heat to fully ripen Pinot Noir, Chardonnay and Riesling – the most successful varieties in the region as a whole. Pegasus Bay is Waipara’s leading wine producer. 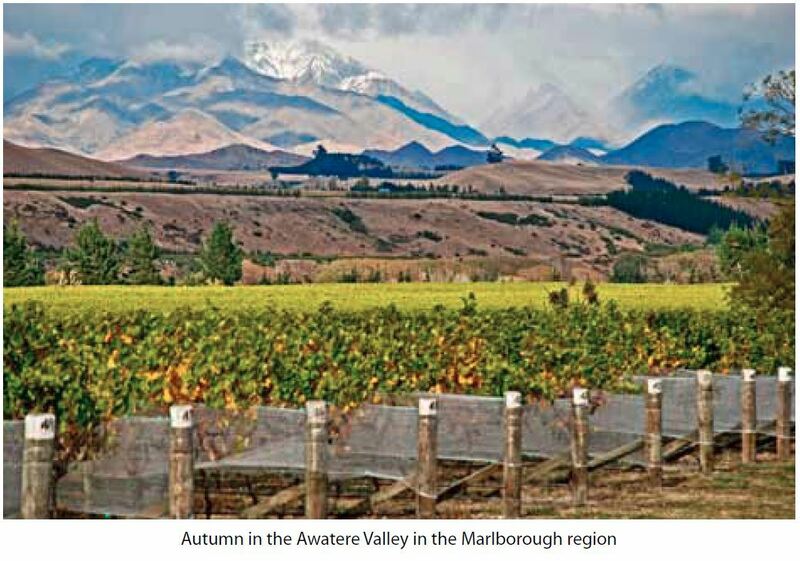 In the very south of Canterbury is emerging the country’s newest wine region, the Waitaki Valley, a source of Pinot Noir from limestone slopes south of the Waitaki River. In Central Otago conditions are like nowhere else in the country. There is even a continental-type climate influence with long hot days and cool nights during the growing season. Interestingly the rock types are much older geologically and hillsides are favoured in order to limit frost damage. Pinot Noir is emerging as the most important variety, though the potential for fine Riesling, Chardonnay, Pinot Gris and Gewürztraminer is already proven too. After a slow start new vineyards and wineries have taken root at an ever increasing pace since the mid-90s. Foreign investment, celebrity ownership (such as actor Sam Neill’s Two Paddocks) and high prices for Pinot are all part of the mix but the hype is already backed by some serious quality. How much more is to come with still greater identification of the top sites and from more mature vineyards?